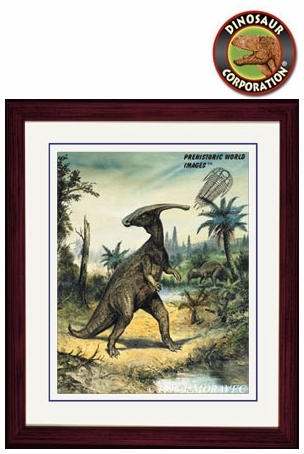 Home | DINOSAUR PAINTINGS | Parasaurolophus walkeri | Parasaurolophus Picture, Cretaceous Period - Framed 17" x 14"
Parasaurolophus Picture, Cretaceous Period - Framed 17" x 14"
Parasaurolophus walkeri 14" x 17" framed with double matted in glass. Cretaceous Period. ▪ Parasaurolophus Picture, Cretaceous Dinosaur, 8.5" x 11"
▪ Parasaurolophus walkeri Art Picture 13" x 19"
▪ Parasaurolophus walkeri, Cretaceous Period, 16" x 20"
▪ Parasaurolophus, Photographic Quality, 20" x 24"
Parasaurolophus Picture, Cretaceous Dinosaur, 8.5" x 11"
Parasaurolophus walkeri Art Picture 13" x 19"
Parasaurolophus walkeri, Cretaceous Period, 16" x 20"